Nothing says Summertime to me more than the classic look of layering crisp whites and neutrals together for a look of sophistication that never goes out of style. And if you're still a believer in that old rule about not wearing white until after Memorial Day, don't waste another minute getting started! While recently I've had fun adding a few new pieces to my summer wardrobe that include some of the bold new color tones like coral, emerald and lemon zest, I'm still a firm believer in always maintaining a solid foundation of fresh classic white pieces. What I love about the whites is how they're super easy for layering and they always make winning combinations to use for Summer Traveling wardrobe too. I've heard it said that the color black is, by definition, the absence of color and light. On the opposite end of that spectrum, whites do not have any real hue, but they are described as the color the human eye sees when it looks at varying spectrums of light. If you really stop and consider that definition, it can be mind boggling to realize what a vast number of shades of white that leaves available to us. If you've ever had to choose a white paint color for your walls, you're probably already aware how many there are. When it comes to infusing whites into your wardrobe and accessory choices, this can be quite an exciting endeavor, so let's get started. 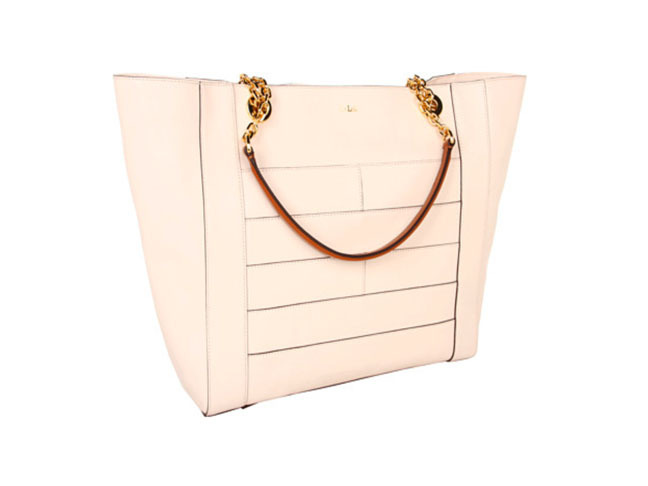 Nothing signals the start of summer for me more than when I get the urge to change purses into something like this Ivory leather Guernsey Tote. It's fresh Ivory color tone goes with just about everything and it's oversized enough so you can take everything along with you're on the go with your kids for their new summer schedule or while vacationing with your entire family. Plus, it's straps are the perfect length to carry comfortably on your shoulder and you'll love the look of it's decorative gold toned hardware accents. If you're a fan of lightweight linen, you'll going to love adding this Relaxed Linen Tunic to your wardrobe. What makes it such a great piece is that it's versatile enough to be worn over jeans, layered over a camisole or worn unbuttoned as a lightweight jacket. And it also makes a perfect coverup poolside at home or when traveling. White nail polish was seen all over the 2013 Spring runways this year and that emerging trend also spills quite naturally right over into Summer. Esse's Oui Madame is one of the many new sophisticated white pearl nail polishes that create a dazzling new interpretation of the somewhat outmoded French Tips from years past and makes this a new look that's anything, but passe.